When you advertise your stock with Tassie Cars you have the option to display your stock list on your own website, for no extra charge. 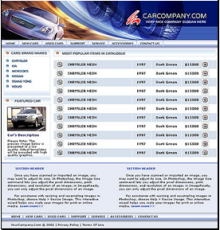 If you don't have a website, we can create one for you! Give directions on how to locate you and your contact details. Website searches (powered by Tassie Cars) are easily added to any type of web site, and can be customised to suit the design of your web site. In addition, when we create a website for you, we go beyond simply placing a banner with your logo above your stock list. We create a homepage, a stock list page (optional search facility) and a contact us page which we fully tailor to suit the image you have created for your business. Just ask us for a quote, our prices are very reasonable. Your website fully hosted on our servers, for free - or hosted elsewhere, it's up to you. Still want to know more? Please feel free to contact us and we will answer any questions you may have.